Is there any time more rich and fulfilling than Thanksgiving? Every year we take the Thanksgiving holiday to remember the abundance in our lives; blessings both tangible and intangible that enrich and fulfill us. We make lists overflowing with delicious foods, pen holiday cards to the people we love, and shove more junk than we knew we had into dark closets to await the end of the holiday season. 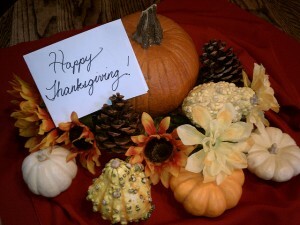 Thanksgiving allows us to relish the bounty present in our daily lives. It lets us give back to those we love and remember the members of our community lacking in the basic amenities we take for granted. Don’t let junk and stuff clutter your Thanksgiving. Take the holidays to savor time spent with loved ones. Forget stuffing your holiday with more decorations, and focus on creating memories with your friends and family. Take part in a canned food drive or donate old holiday-themed dishes to those less fortunate. Teach your kids or grandkids a Thanksgiving recipe. Make a new tradition. And above all, give thanks for the people in your life. After all, traditions and heirlooms mean nothing without the seasoning of family history. While your family enjoys weeks of leftover turkey and stuffing, Mr Junk will remove the evidence of your holiday festivities. Pile up your donations, holiday decorations, and Thanksgiving junk; Mr Junk will take care of the rest.